In many respects, it was a wonderful game for the Bulls Saturday night, though they lost 89-82 to the New Orleans Hornets. Yes, losing is not so wonderful, even if they still are 2-1. But I thought they competed hard, getting 15 offensive rebounds to nine for the Hornets. The Bulls led with 11 steals, had fewer turnovers with a season low 12, scored more points in the paint, second chance points and fast break points. Though coach Tom Thibodeau and I differed on this somewhat, I thought it was a very competitive effort. The Bulls did a lot of good things. Other than put the ball in the basket very often, which I will admit is very important in basketball. After shooting 63.8 percent in routing Cleveland Friday night, the Bulls Saturday made just a third of their shots and just 26 percent after halftime to lose at home to the team with the poorest record in the Western Conference last season and missing its two top players, rookie No. 1 overall pick Anthony Davis and big money free agent Eric Gordon. Thibodeau had his objections to the Bulls’ performance, and he was right. They missed too many layups, often on breaks, by not going up strong enough or into the defense and the Hornets’ superior size. They dug an early hole, falling behind 16-6, though I thought more because they were trying to take advantage of the matchup with rookie Austin Rivers against Richard Hamilton and got a bit selfish and out of position in transition. And after regaining control of the game ahead 44-37 late in the second quarter despite the horrific shooting—and most were pretty good open looks—Nate Robinson got himself out of control taking a couple of wild shots and losing Greivis Vasquez, who made back to back threes to give the Hornets a 46-44 halftime lead. All true, though this game perhaps more than the first two represented the essence of this Bulls team that will make it both an interesting and perhaps excruciating season. There really isn’t that great, go to scorer. There will be games, like in the first two, where Boozer or Hamilton gets going, Deng as well as he led the Bulls Saturday with 19 points despite still not seeing his jump shot fall. But this has to be a team that plays almost perfectly in tandem with one another without an MVP scorer like Derrick Rose. As badly as they shot Saturday, they really weren’t that far away. Marco Belinelli, who had his best game as a Bull with 13 points against his former team, had an open look at a three with 53.5 seconds left to bring the Bulls within one. It was off, and the Hornets made all their foul shots the rest of the way to get the great win for them. Thibodeau, of course, was disappointed since he, like most coaches, look at what else the team could have done to succeed. And so did his players. I agree there were times the Bulls didn’t power into the rim, and there were times they maybe didn’t get back quite as perfectly as usual. But these are not players who mail in a game, who ever really lack effort. Right down to the last seconds they were forcing a turnover with 20.9 seconds left and down five that gave Robinson a three he missed to effectively end it. They hammered at the boards, clawing back in the fourth quarter with five offensive rebounds, a pair of steals and three blocks. But in trying to find someone to score, Thibodeau sat Hinrich, Hamilton and Boozer in the fourth quarter as they finished a combined four of 26. A gassed Deng and Noah played just about the entire fourth and were a combined one of five shooting. Robinson was four of 11 in the fourth quarter alone. The entire team attempted 22 fourth quarter shots. They were fighting. There just isn’t reserve in their tank without Rose. It’s OK. That’s who they are. They are a team that has to play together and play well, get easy baskets and hope at least two guys are making shots. They’ll have a lot of close, low scoring games. Because they play so hard, generally smart and are serious minded, they’ll be in just about all their games. Some super talented teams might take them out. But they’ll generally be there at the end. But there will be games like Saturday’s where there just isn’t anyone who can bail them out of a bad night. It’s what the great stars do, and he’s still getting ready. It was a disappointing start for the fans as the Hornets were without Chicagoan Davis, the exciting rookie who sustained a mild concussion in Friday’s home win over Utah and stayed home in his team’s only trip back to Chicago this season. If Davis was upset, no one knew. But Williams was as before the game he curiously condemned the league’s conservative policy on concussions, which came about with the recent controversies regarding football and hockey players. Tough guy. Actually, Williams is and one of the best young coaches in the league. Even last season as his team was overmatched, they were known to defend hard and never quit competing. So it’s been little surprise to many they play as hard as they do even if the wins weren’t expected. Though Rivers hasn’t shot well and seems to have an unusual shot with a lot of his hand on the ball, he is very quick on the dribble and scored early against Hamilton. The Bulls tried to go back with Hamilton at the rookie, but the Hornets’ big men helped well, forcing the Bulls into four turnovers in the first three minutes of the game. The Hornets got some runouts as a result, upsetting Thibodeau about the transition, and that early lead. Though it was worse as the Bulls’ shots were clanging off even though often open as they still did the things they do well, like moving the ball. They had 21 assists on their meager 29 baskets and still went to the free throw line 25 times, though Thibodeau felt they shied away at the rim on fast breaks a bit too much at times, which was true. But the matchups with the Hornets also proved troublesome as Ryan Anderson had 12 points and 13 rebounds and Robin Lopez 16 points and four blocks. It might have been a game to use Gibson more early, though Boozer has been scoring well and the Bulls desperately need his scoring. But with the Hornets having the so called “stretch four” with the three point shooting Anderson, the Bulls had to put the quicker Noah on the 6-10 Anderson. That left Boozer inside on Lopez, who is seven foot and was able to make several short jump shots easily over Boozer. I’d admit I’ve never seen this Lopez make jump shots, so it was a surprise to me as well as the Bulls, I’d guess. The Bulls are going to be smaller than many teams as Thibodeau doesn’t use Nazr Mohammed that much given he doesn’t rotate as quickly. The Bulls big men of Noah and Gibson may be the best in the league at switching and taking even guards and holding them off. Thibodeau’s defenses rely on a lot of help, and it’s not a strong element for Mohammed, who played just four minutes. Still, the Bulls handled themselves well on the boards, outrebounded 44-41 but dominating the offensive boards as the Bulls had 13 more shots. And still made three fewer baskets. Yes, they did most everything but the little thing of seeing the ball go through the netting. This is where the Bulls see the good Nate and bad Nate. Thibodeau went to him like for a hard thrower out of the bullpen. He made some impressive plays and had five rebounds and three steals and a couple of daring full court dashes for baskets. But he is one of those who will try to make the hero shots and dribble too much into his own offense. It is difficult to avoid when losing, but also something Thibodeau asks the team to stay away from doing. Robinson, though, did give the Bulls that boost coming in along with Belinelli, who got the Bulls within 21-18 after one with a runout slam dunk and three. Belinelli was then pumped up with a flying fist when he made another three along with Robinson and Noah fast break scores in the second quarter as the Bulls took that 44-37 lead. The layups do stand out as the Bulls were denied at least a half dozen times at the rim. Thibodeau didn’t like the occasional looking for fouls that weren’t called and the Hornets taking advantage and running. That sort of thing is unusual for this Bulls team. And the Bulls this season have been doing well attacking the rim and getting to the free throw line. I thought they still were aggressive, though sometimes not completing their move. That close of the second quarter turned out fatal. After halftime, they looked to Deng inside for a mismatch against Al-Faroug Aminu, Deng sealing a few times and getting a pair of scores. But the Hornets big men adjusted with help well, and the Bulls could not make shots still as Hinrich, Hamilton and Boozer combined for three of 14 in the third and the team 25 percent overall. Even with that, the Hornets led just 66-60 going into the fourth quarter. Vasquez, who led the Hornets with 18 points, hit a pair of jumpers early in the fourth to hold off the Bulls as they tried to make a run with a Robinson pull up, Gibson with a strong post move and Noah and Robinson keeping plays going with blocks and steals. 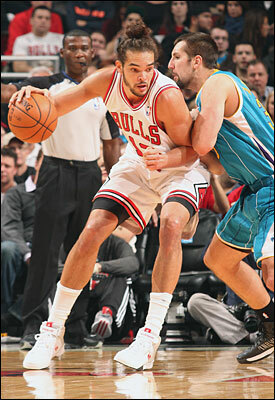 But the Bulls also got burned a few times by Jason Smith as the Hornets isolated on the smaller Robinson. Noah came to help and the backside protection was late, enabling Smith to get six points in about two minutes midway through the fourth to hold off the scrambling Bulls. By now, Thibodeau had seen enough of much of the starting lineup and decided to run it out with Belinelli, Gibson and Robinson with Noah and Deng playing the entire fourth. They couldn’t muster even 30 percent shooting combined and the closest the Bulls got was down four with that Belinelli three in the last minute. You sensed it wasn’t going to go the way little did. Though I suspect we’ll see more of these in the nights to come. It’s been said if you look for perfection you’ll never be content. But don’t ask Thibs to stop trying.